FERRARIO - [ Kerengnatnuk chief of the Botocudos with his family ]. FERRARIO, G. - [ Kerengnatnuk chief of the Botocudos with his family ]. [ Kerengnatnuk chief of the Botocudos with his family ]. - FERRARIO, G.
Title : [ Kerengnatnuk chief of the Botocudos with his family ].. Size : 5.9 x 9.4 inches. / 15.0 x 24.0 cm. Description :Aquatint depicting Kerengnatnuk, chief of the Botocudos with his family. Botocudo (from Portuguese for botoque, a plug, in allusion, to the wooden disks or plugs worn in their lips and ears), is the foreign name for a tribe of South American Indians of eastern Brazil, also known as the Aimorés or Aimborés. 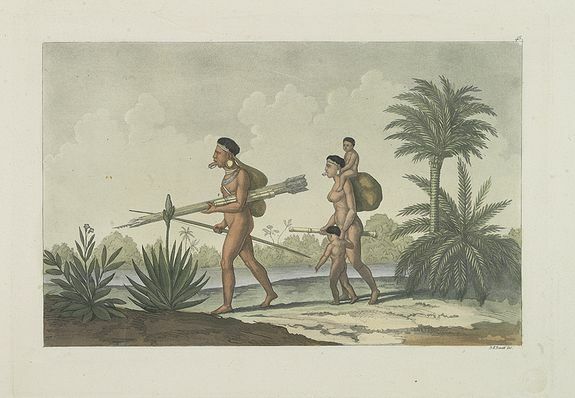 The Botocudos were nomadic hunter-gatherers, wandering naked in the woods and living from the forest.